The Phoenix Bat Company has been making premium rock maple and white ash bats for over 10 years. Born out of a craftsman's garage, Phoenix now produces bats out of a state of the art, custom bat manufacturing shop. Phoenix produces all of their bats on the most advanced model of the most advanced lathe in the bat industry - and they are the only bat manufacturer to have it. Coupled with the use of only premium grade woods, Phoenix delivers the highest quality bat consistently, from bat-to-bat, year-to-year. Demand for Phoenix Bats has grown every year from players at every level, coming almost exclusively by word of mouth from thousands of very satisfied customers across the country. 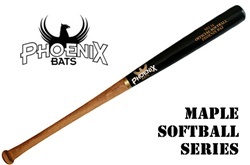 For pros down to little leaguers, for vintage bat leagues, softball teams, and coaches, Phoenix has a bat that everyone can fall in love with. The Phoenix brand is synonymous with power, craftsmanship and attention to detail. 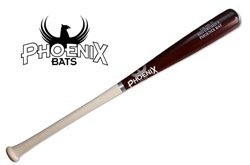 Quality, Consistency, Craftsmanship - pick up a Phoenix Bat and you'll know this is not your big box store-bought bat! This maple Coach's Fungo bat is very comfortable in the hand while still providing a good grip. Add a barrel inscription at no extra cost! 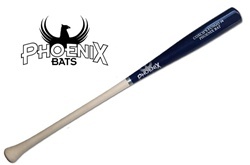 The Phoenix Bat DR100 Youth Ash Wood Bat is a great bat for 11-13 year olds. With a weight drop of -5, it eases the transition from a youth barrel -8 to a full size barrel -3. Add a barrel inscription at no extra cost! 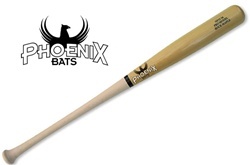 The Phoenix Bat K455 Youth Maple Wood Bat is among the lightest of our youth bats with a weight drop of -8. The K455 is designed like an adult bat with the weight of a youth bat. Weighted slightly toward the barrel, with a nearly straight handle. Add a barrel inscription at no extra cost! The Model R141 is a very versatile bat and a solid choice for team use. Has a very slightly flared 15/16" handle and a medium sized 2-1/2" barrel. Evenly balanced throughout. The weight drop is -2.5 in maple and -3 in ash. Typical user: a slap-it-in-the-gaps type or a power hitter. Add a barrel inscription at no extra cost! 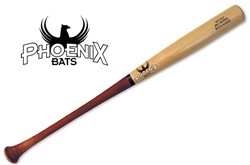 Phoenix's most popular wood bats, ready to ship immediately! Choose from Models BB71, F110, R141, R318, and V243. Available in Ash, Birch or Maple. Bats have Natural barrel and Natural handle. The Model BB71 is Phoenix's lightest pro bat, with the largest length-to-weight difference. Comes in a -3 weight drop and is available in 12 different colors. Choose between Maple or Ash. Add a barrel inscription at no extra cost! The Model V243 is a true power hitter's bat. Bigger 2-9/16" barrel, with a very slight flare in the handle, and end weighted for power. The weight drop is -2 in maple and -3 in ash. Add a barrel inscription at no extra cost! The Model P161 is an ideal bat for a power hitter who likes a thicker handle. Big 2-17/32" barrel, large knob, and end weighted for power with a straight handle. The weight drop is -2 in maple and -3 in ash. Add a barrel inscription at no extra cost! The Model H73 is a very well balanced bat with a smaller 2 3/8" barrel and a very large flare in the handle. The weight drop is -2 in maple and -3 in ash. Add a barrel inscription at no extra cost! The Model F110 is a great bat for the leadoff hitter or player who needs to get on base more often. Very balanced, with a slightly thicker 31/32" handle. The weight drop is -2.5 in maple and -3 in ash. Add a barrel inscription at no extra cost! The Model NP13 is a large barreled power bat yet very well balanced. For the power hitter who is concerned about an end-weighted barrel. The weight drop is -2.5 in maple and -3 in ash. Add a barrel inscription at no extra cost!